Blogging is a wonderful hobby (or profession for the lucky few). Whether you use it to journal and share your life, or indulge a passion, it introduces you into a fun and friendly community and, well it beats watching bad TV all the time. With Dependent on Gadgets, I spent the first few years working to get my writing to a standard I was happy with and then going from using clipart and Flickr for photographs to doing as much as possible by myself. If there is one problem with blogging as a hobby for me, it’s having free time at the same time as being in the right mood. A typical post requires a couple of weeks to research a topic (or use a gadget enough to get over the initial novelty factor), then first draft, photographs, second draft and finally, production! I enjoy every stage, but I really have to be in the right mental place to write a decent draft. Equally, I might need to be physically in the right place, or at the right time of day to get the photographs I need. The one stage that I can do more or less anytime is the edit - being able to access my documents anywhere anytime means I can fit it into gaps in my day. Thank you Google Drive! In order to keep posting regularly enough to attract visitors (thanks for coming! ), I’ve learned that the best thing to do is have several on the go at the same time. Then, when some time or the mood comes to me, I can choose to write, photograph or produce and not have to work through one post in linear fashion. Of course it was also an excuse to try out some new productivity apps in order to keep track of everything and the one I’ve stuck with is Trello! 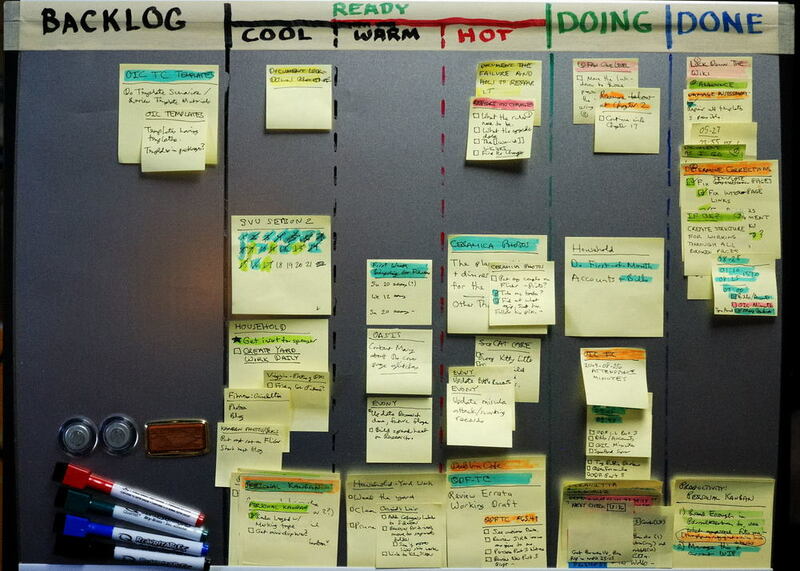 Personal Kanban is still very popular - but I prefer a digital solution. It's a great way to visualise and track your work or ideas. Trello is like a digital re-imagining of the Kanban system, developed by the Japanese where component supply on production lines was tracked with instructions on cards which were passed down the line. In Trello, you create boards representing each stage of your production process and then make cards that can move through the processes until the job on the card is completed. As you can see, whenever I have an idea, I create a card on the left in the ideas column. Once one gets picked out, it moves across to the next, which I’ve titled ‘In Research’. Stage by stage, each post works its way along from left to right and I can start to choose which one to pick up and progress easily when some free time comes my way. It’s a simple, but effective way to keep track of projects and works nicely for my blog. I can see exactly what stage each idea is at and dive into any to get on with straight away! Being digital, Trello can do some clever things with the cards themselves, so let’s take a look inside one of mine to see what’s possible. This is my card for a recent article. As you can see, I have a link directly to the draft, which I compose in Google Drive. This means I can use Trello as my blog’s hub and click directly out from here to get on with some writing. You’re not limited to attaching to Google Drive files. You can also link from here to Dropbox, Box, or even any hyperlink that you think might work for you! The next useful function for a blogger is to be able to set up a checklist for the card so that every step of the way is completed in organised fashion. Here’s my checklist for the promotion of a post and I can quickly see what I need to do next to get a post ready. 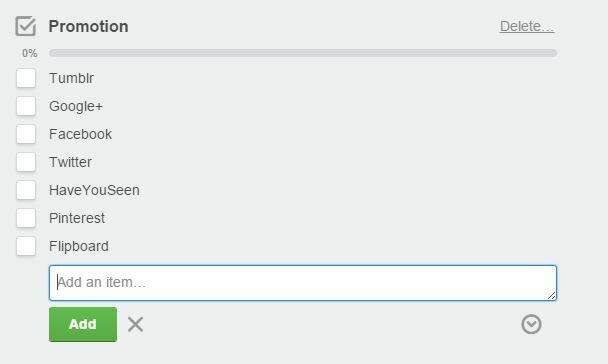 A handy feature of Trello is that I don’t have to rebuild this checklist every time I create a new card. I can quickly import a copy from one of the others. I also have a second checklist which I use to make sure I’ve promoted my new article properly, once I’ve hit the ‘Publish’ button. Finally, to keep me motivated, I can use ‘Due Date’ to schedule my posts and determine the order of release. Now, I won’t lie to you, I regularly miss these dates. They’re more of an aspiration if I’m honest. But, if you’re stricter with yourself than me, this helps alongside a content calendar. In fact, there is even a calendar view to help you with your scheduling. 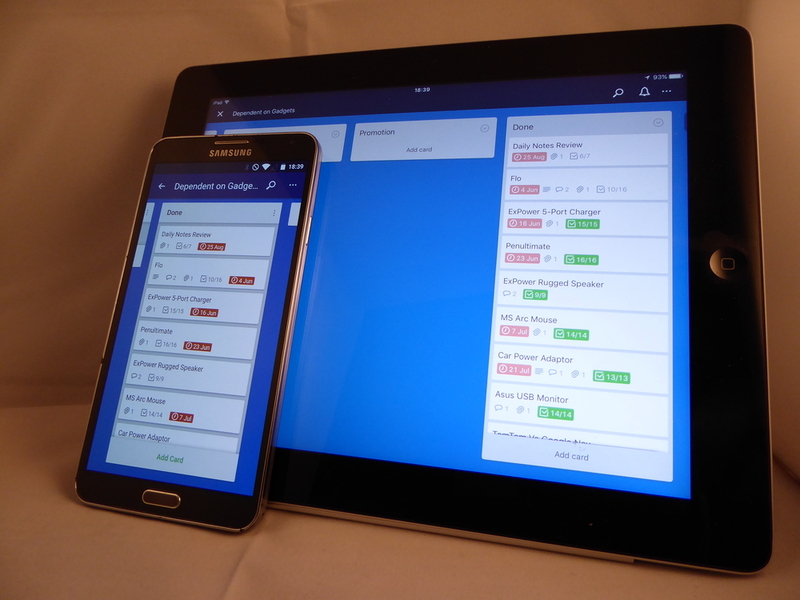 Like all good web-apps, Trello is also available on mobile and tablet as an app and it looks great on both, with all the functions intact. 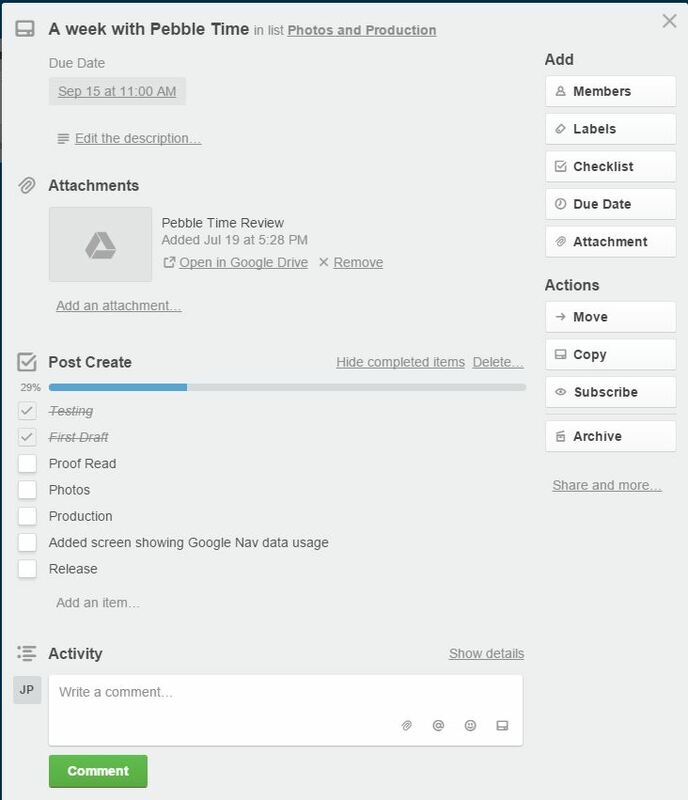 Dependentongadgets.com is all my own work, but if you’re writing a blog as part of a team, then Trello’s social and group collaboration features will be of interest too. In fact, you can even run several boards and run lots of blogs! Individual cards can be commented on, generating discussion threads and those comments can include attachments and emoticons. If you really want to draw a colleague’s attention to a comment, you can address them using the @ symbol, just like on Twitter. Given how much can be going on when lots of people are involved, this card system could really help keep things manageable and stop your blog becoming an administrative nightmare! If blogging is a serious hobby, or a serious business, Trello is well worth investigating as a platform for keeping note of your ideas and developing them into finished posts. Are you a user of Trello? Or perhaps you know of a good alternative method for managing your blog? Please share in the comments.